How can urban planning methods be improved, and how could un-used industrial land, or brownfields, be utilized in a better way? That is questions the Central Baltic programme project Baltic Urban Lab is looking into. New planning tools and models are developed and tested on selected un-used industrial lands in four project cities – Norrköping in Sweden, Tallinn in Estonia, Turku in Finland, and Riga in Latvia. In Sweden, a visualization tool has been developed where you can have a look at the ground in cross-cut to find out which pollutions there are to be found in the inner harbor of Norrköping. This is one of the brand new methods that have been developed to fulfil the overall aim to find solutions for better management of urban brownfield areas. The Baltic Urban Lab project tackles a common challenge for all Central Baltic cities – to develop and build attractive and sustainable urban areas and to re-use un-used industrial land, with its contaminants and hazardous substances in mind. The pilot sites in the project where new planning methods are tested are the inner harbour in Norrköping Sweden, the Skoone Bastion area in Tallinn, Estonia, Turku Science Park Area including Itäharju triangle in Finland, and in Mukusalas Street in Riga, Latvia. The project has seven project partners, and is led by the Union of the Baltic Cities Sustainable Cities Commission in Finland. In October 2017 I met with representatives from the City building and Development office in the Municipality of Norrköping, to find out about their role in this interesting project and which methods they are working with. For this interview, I talked with Frderik Wallin from Norrköping City, Erik Telldén who develops the visualization tool and Ellinor Källhom who works with city communication. I asked them to explain what kind of planning tool they have developed. - The tool functions like the famous interactive autopsy table where you can interact with the table, but this time it is the ground that is dissected instead of the human. The table is called Earth Autopsy. You choose which parts of the land in the inner harbor of Norrköping city you would like to look at, and then go down layer by layer to see what kind of contaminants there are in the ground. You can also see cross-cut what the ground looks like in different areas. - The tool is a new way to communicate and show environmental data in visualizations to different kinds of groups in the society, like for example decision makers, politicians and the public. It is a big challenge to explain how pollutions function in soil and water and how they have affected the ground in different areas, but still, it is an important knowledge in the city planning process. Initially we did not know if it would be possible to develop a tool like this, we just had a loose outline, so now we are very proud of having developed this visualization tool. We have also very good co-workers. A local company, Interspectral, supports us with the programming tool. It is obvious that this tool will facilitate discussions regarding environmental matters, but why is it so important? - It will create a totally new understanding of these complicated matters. The tool will have a huge impact on the society and the citizen perspective, as it will allow for people to really understand abstract matter. For example it can show decision-makers and the public why a building needs to be demolished. 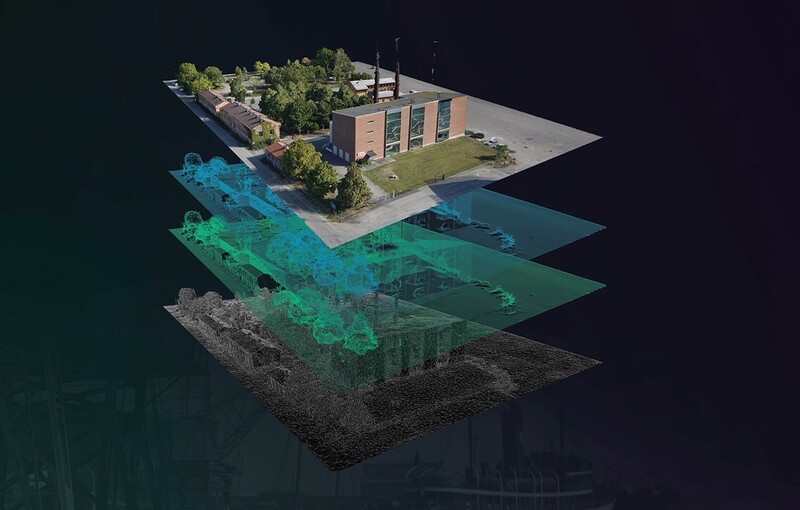 - In our visualization we have also included information about history and archeology, and explain how the industrial city of Norrköping has been developed through the years in order to create a greater understanding for the background of the city, and the reason why it look like it does today. So the result holds also cultural and archeological aspects. How is it possible to know for sure which kind of pollutions there are in the ground in the inner harbor of Norrköping city, layers and layers down? - It lays hard work behind the result. We have drilled in the ground down to 30 meters depth at every meter in the areas that we are analyzing. So we have a substantial amount of information regarding the pollutions through the years to add to our visualization tool, which is displayed in a 3D model. There the findings at different depths are visible, like e.g. cyanide and arsenic. The project started in autumn 2015 and will end in December 2018. How do you think this visualization tool could be used after the project has ended? - For our part, showing the pollutants in the ground in the inner harbor was the first step in the development of this environmental tool. Furthermore, we will be able to add and visualize how, for example, noise and particles are spread in the city – information that so far only has been visible in dull charts. It is not only officials at the city planning office that has a need for this tool. It will be an important planning tool for politicians, decision-makers, consultants and entrepreneurs. Furthermore it is also very important when it comes to the citizen perspective and democracy aspects as it will increase the understanding of future city planning. What has this Central Baltic project meant to you? Have you appreciated to being a part of it and the cross-border cooperation? - Without this project the visualization tool would never have been developed as we would not have had the needed resources to put into the work. The vizualisation tool will definitely be very important for our future work with city planning. The experience exchange with the other project partners has also been very valuable. Everyone is good at different things, and apart from the benchmarking between the project partners, we have gotten valuable feedback regarding which qualities they have found in our way of working. So which will be the next step? - The project is now well into implementation and partners are working towards finalizing the methods developed during the work with the pilot sites. There are also thoughts about further cross-border collaboration already – even outside the programme region. Fredrik tells, that he is already thinking about project 2.0 which could include collaboration with West-European operators.